In the news so far for leading the pack of 153 MPs facing criminal charges in the 15th Lok Sabha, Jharkhand Mukti Morcha’s (JMM) Kamleshwar Baitha is now in focus for another interesting reason. MPs from Andhra Pradesh are sulking and not without a reason. The 33 MP-contingent is the single largest block that the Congress received from a state in the Lok Sabha this time but instead of giving them a pat on the back in the form of matching number of ministries for this remarkable feat, the party landed over just one Cabinet, one Minister of State with Independent charge and four MoS posts. Farmers’ representatives are demanding that fertiliser subsidy be given directly to farmers instead of manufacturers and are also demanding an increase in the public and private investment in the agriculture sector, proportionate to the population dependent on the sector in the country. Students interesting in getting off the beaten track in selecting a course at Delhi University can choose from a variety of not-much-known subjects this session, the main among them being degrees in Portuguese, Spanish, Czech or Italian. And those not interested in languages also have an option: a Masters in Buddhist Studies or a degree in Ayurvedic or Unani medicine. The government is coming out with a new policy on Wakf boards aimed at giving them a greater role in minority welfare measures and improving their financial condition. "We are in the process of giving final touches to a new policy regarding the Wakf Boards' functioning with a thrust on bettering their financial health and envisaging a greater role for them in providing funds for minority welfare works," a senior official of the Minority Affairs Ministry told PTI. That JD(U) president Sharad Yadav’s opposition to the women’s quota bill in Parliament does not have his party’s official backing is apparent from the fact that two days after he registered his opposition to the proposed bill in its current form no other JD(U) leader has come forward to endorse his view so far. He is 14-year-old ready to represent his country on a stage like the International Labour Organisation (ILO) with the confidence of a seasoned activist. Manan Ansari, a young child labour activist, hailing from the remote village of Dhaurkola in the mineral-rich state of Jharkhand, who will speak on child rights at the forthcoming conference at ILO in Geneva on June 12. With the Gujjar mahapanchayat all set to discuss the reservation issue afrest at Mehravar village in Bharatpur, 10 km from Pilukapura, firebrand Gujjar leader Kirori Singh Bainsla is in the limelight once again. Hyderabad is fast emerging as the focal point of the swine flu infection in the country with the city accounting for six out of the total eight confirmed cases of the H1N1 influenza. The latest was the case of human-to-human transmission of the deadly virus, affecting four persons in all. A 28-year-old software professional, who had travelled from Philadephia to the city by British Airways flight 277 on May 31, was tested positive for H1N1 influenza on June 4. One out of every five domestic power consumers in Madhya Pradesh is “dishonest”. At least that is what the state Electricity Board says. 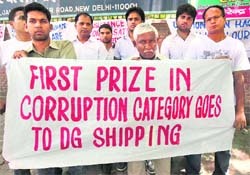 Protestors accuse the government of risking the lives of 25 Indian sailors on board the missing ship, MV Rezzak, in New Delhi on Sunday. In response to the concern raised by India, the government in neighbouring Bangladesh has initiated action against Indian terrorist outfits, including those from North East, operating from their soil, forcing them to desperately look for safe sanctuaries elsewhere. Tension gripped several parts of the city today, as different parts of a human body were found at different locations in a gruesome murder. He is the only MP, besides his party chief Shibu Soren, who is yet to take the oath of affirmation in the House of People. While Shibu is learnt to be away for personal reasons (he lost his son Durga, an aspiring politician, on May 21), Kamleshwar Baitha’s is a peculiar case in Lok Sabha’s history. The Naxal leader, who fought and won the Palamau Parliamentary constituency in Jharkhand on the JMM ticket, remains in jail for his involvement in as many as 67 criminal cases, including murder, murder bid and kidnapping. Since the jailed JMM leader has yet not been convicted, the Election Commission granted him the permission to contest elections after it found his nomination papers in order. Under the law, “yet-to-be-convicted under trial” persons can fight elections unless convicted. In the 15th LS elections, RJD’s Pappu Yadav and SP’s Sanjay Dutt were refused permission to contest polls because they faced conviction for over two years under different sections of the IPC. But in case of undertrial MPs - once elected, they can apply to the authorised court for permission to travel to the Parliament and take oath as an elected representative of the people. Although there were reports of Baitha having already sought court permission for oath-taking, he is yet to turn up. Lok Sabha secretariat has so far not received any information in this regard. Sources in the secretariat today told The Tribune that Baitha and Soren would now have to send the intimation of their arrival for oath taking in writing. Elected representatives of people, under the constitution, can take oath as MPs within 60 days of the commencement of a new Lok Sabha session. In cases where MPs are in jail on account of criminal charges, the relevant court always grants them parole to ensure that their right as an elected member is protected. If an MP does not take oath within 60 days of the start of a fresh session, he stands to lose his membership --- something they can ill-afford. All MPs, including those in jail, by virtue of being elected representatives, get certain special privileges. In jails, too, they are invariably treated as first-class prisoners --- one reason why no MP, even if he is an undertrial, wants to lose his membership. That explains the desperation of BSP’s tainted MPs Atiq Ahmad and Afzal Ansari, who faced disqualification proceedings under the Tenth Schedule of the Constitution (anti-defection law) in the last Lok Sabha. Both these MPs faced criminal charges, and were very keen to retain their membership. As regards Baitha, he shares his fate, in recent LS history, with Punjab’s Atinderpal Singh, a TADA detenue, who got court permission in 1989 to take oath as a member of the ninth Lok Sabha.The Punjab police brought Atinderpal Singh and handed him over to Delhi police. He was then escorted into the Parliament by parliament security and allowed to take oath, after which he was sent back to jail. While in jail, the MPs are only allowed to take oath, which is their right. They enjoy no other facilities of attending the session or getting any allowances. All they can do is correspond with the House, if they want, through the Lok Sabha Speaker or Secretary General. It is another matter that the MoS (Independent) post given to Rajya Sabha MP Jairam Ramesh is turning out to be another cause of heartburn among ministerial aspiratants from Andhra. The ministerial aspirants feel that the state got a raw deal in the government-forming exercise that rewarded under-performing states, obviously to revive the Congress’ fortunes like in Karnataka. Another feeling among Andhra Congress MPs is that state Chief Minister YS Rajasekhara Reddy has let them down and that too for furthering his and son YS Jagan Mohan Reddy’s future ambitions. “Since he was negotiating with the Congress leadership, he could have insisted on accommodating more than just six MPs. There are some very senior MPs who have been ignored,” an Andhra MP says, adding that despite this open unrest among his men, the Chief Minister has chosen to remain unruffled. Explaining the politics behind the seemingly simple situation, he says it was all part of some future planning for his family by the Karnataka CM. “Rajasekhara Reddy is already in control of the state. Now that his son YS Jagan Mohan Reddy has won, projecting him as a great architect of this victory the stage is being set to ensure that he emerges as a power centre in Delhi. Jagan Mohan Reddy has already started showing that he is in control. He is moving around with selected MPs to pursue issues related to the state,” he says. Andhra sent 33 Congress MPs out of a total 42 seats in the state The other southern states and Puducherry put together elected only 28 Congress MPs. In Tamil Nadu, the figure is eight out of 39, in Kerala 13 out of 20, in Karnataka six out of 28 and in Puducherry one out of one. But despite this spectacular performance, only S Jaipal Reddy managed to become a full-fledged Cabinet minister. Barring Jairam Ramesh (MoS with independent charge), other five are from the Lok Sabha. Even among the four MoS, the only new face is A. Sai Pratap, who made it since the former Minister of State for Woman and Child Welfare Renuka Choudhury lost from Khammam this time. In all, the state’s quota in the Council of Ministers remained unchanged at six but it includes Rajya Sabha nominee from Andhra Jairam Ramesh, which is the cause of much resentment among the aspirants since they feel that instead of the Andhra quota he should have been included from the so-called “talent quota”. The other three MoS include D. Purandeshwari, daughter of TDP founder NT Rama Rao, who has been retained but without an elevation. Similarly D. Pallam Raju, who is in the government but only as an MoS, and Panaba Lakhsmi for whom it is a second stint as the minister of state. Farmers’ representatives are demanding that fertiliser subsidy be given directly to farmers instead of manufacturers and are also demanding an increase in the public and private investment in the agriculture sector, proportionate to the population dependent on the sector in the country. In a recent meeting with Finance Minister Pranab Mukherjee, they also urged the government to include farm activities in its flagship programme - the National Rural Employment Guarantee Scheme. Secretary-General of the Consortium of Indian Farmers Associations (CIFA) P Chengal Reddy, who was among the representatives from the agriculture sector invited by Mukherjee for discussions on the sector for Budget 2009-10, says the Finance Minister’s response during consultations “was very encouraging”. “The minister said India must achieve four per cent agriculture growth to overcome important issues for providing food security and the PDS. He said whatever measures were needed to increase productivity and sustain the government would be initiated by the government and also that the government was open to any good suggestion,” Reddy told The Tribune. CIFA is now in the process of putting together reports by various farmers’ organisations, which will be submitted to the Finance Ministry by June 10. The next step will be to lobby for implementation of their demands for which they have sought an appointment with Prime Minister Manmohan Singh, Congress President Sonia Gandhi and Agriculture Minister Sharad Pawar. Reddy says regarding financial reforms needed in the farm sector, the first and foremost step should be an increase in public and private investment in agriculture sector. “Agriculture credit flow guidelines to small farmers should be redefined. Indirect finance should not be included in 18 per cent target for agriculture credit and sub limit of 10 per cent out of 18 per cent should be fixed for marginal farmers and tenants. Rural credit / deposit ratio of banks, which is now at 57 per cent, should be maintained at 75 per cent and the number of rural bank branches should also be increased,” says Reddy. Policy reform demands include direct fertiliser subsidy to farmers, reorganising the functioning of the Food Corporation of India, having a long-term export policy for agriculture produce, encouraging the APMC, contract farming and commodities trading, incentivising PPP in agriculture research, extension and rural programmes like health, education and also mechanisation of agriculture and water conservation. They also called for the implementation of the National Commission on Farmers Report that says that the MSP should be cost plus minimum 50 per cent of the cost besides converging NREGS with farm activities. “For providing social security to farmers, it is important the government should recognise farmers as entrepreneurs and establish commodity-based farmers’ organisations that can provide feedback,” says CIFA policy analyst Kapil Mishra, explaining that whenever the goverment talks about investment, it was largely in context with service or manufacturing sector and not about agriculture. “This despite the fact that 70 per cent of our population is directly dependent on agriculture for livelihood,” he adds. Prof Kusum Aggarwal from the department of Germanic and Roman Studies says, “We offer language courses like Bachelors in Portuguese, Spanish, Italian, German and French. A substantial rush for admission forms has been seen in the past week and more students are approaching for courses in Spanish, Italian and German. So far, we have received about 1,000 applications, which is not a bad count for the first week. Last year, the department received 2,500 forms.” These courses, says Aggarwal, deal with literary and cultural studies of European nations, thereby providing an in depth knowledge of the social manners of these countries. Notably, a lot of job openings have of late come up for students graduating in languages like Italian, Spanish, German or Portuguese. They can work in different companies as interpreters, in BPOs, in educational sector, etc. In each of these language courses, there are 34 seats available, and the admission is through an entrance test, plus the merit in Class XII. The entrance tests comprise of general knowledge, linguistic skills, comprehension and understanding of the course. Buddhist Studies is another rare degree a student can go in for at DU. The department offers an MA in Buddhist Studies, a certificate and a diploma course in Pali language. The course has a rather innovative syllabus, which has papers on Buddhist History, Philosophy, Pali-based Buddhism, Tibetan Language and Buddhism, Classical Chinese Language and Buddhism, etc. "A number of such proposals are with us. There are proposals for strengthening the Wakf Boards as well as for providing statutory powers to them," the official said. The silence of Bihar Chief Minister Nitish Kumar on this issue also lends credence to the prevalent belief that the party did not agree with Sharad’s stand. When asked by reporters whether he also subscribed to the party chief’s opinions on the bill, Nitish parried the question, saying “we’ll see when it is tabled in Parliament”. However, at the same time the CM had lavish praise for the Congress-led UPA government in New Delhi for announcing a 50 percent reservation for women in panchayats and urban civic bodies, remarking “the Centre was following the Bihar model”. Without mincing words Nitish strongly advocated empowerment of women for “speedy development of the country” and claimed his government was the first to provide such a quota to women in panchayats and civic bodies in Bihar. Ansari has been invited by ILO's International Programme on the Elimination of Child Labour (IPEC) to attend the special plenary session of the International Labour Conference. "Manan will be speaking of his experience about child labour at a global stage like ILO where leaders across the world will listen on the plight of this issue (child labour)," Kailash Satyarthi, founder of Bachpan Bachao Andolan (BBA) said. Born in a poor family with six siblings, young Manan was forced to work along with his family in one of the many unorganised and illegal mica mines dug by villagers. "My work required me to collect 'dhivra' (mica) pieces from ten in the morning to six in the evening. Sometimes, I couldn't get any dhivra for earning...," the young boy recollects. "We had to dig up pits and sometimes, those pieces used to pierce into open wounds which would later result in infections.."
Organised mining is now mostly closed in these parts as there is no high quality mica left. The soil is also not fit for agriculture. The Naxalite problem adds to the woes of this remote area. Left with no other options, many families like Manan's are forced to employ their children for extra income. "I could not study much as my family's state did not permit me. And our nearest school was 15-20 kms away. However, it was after BBA's arrival that my parents allowed me to come along with them and I studied further." In fact, this young boy topped his Class VII exams at Sohtana High School in Jaipur where he presently studies. Ask about his purpose at the forthcoming conference and Manan speaks out his mind: "I am thrilled at the opportunity to speak. I would like to speak about India uniformly implementing labour laws. Action should be taken against those who force us into labour and also who exploit our labour." Though Bainsla seems prepared to lead the third Gujjar agitation over the reservation issue, what remains to be seen is whether he enjoys the similar support of the community. Much water has flown since the last year’s Gujjar agitation spearheaded by him in which 71 persons lost their lives. First and foremost, Bainsla joining the BJP on the eve of the general elections and contesting as the party candidate from the Tonk-Sawai Madhopur Lok Sabha seat has lent a political hue to his personality. The charges of Bainsla being hand in glove with the previous BJP regime flew thick and fast when he, along with some Gujjar leaders, reached an agreement, proposing reservation to the Gujjars and other castes last year. 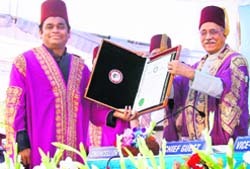 Interestingly, in 2007 also, he had withdrawn the Gujjar agitation without getting any assurance from the state government regarding grant of ST status to the community, giving rise to rumours about a secret pact between him and then the BJP government. His move to join the BJP only gave a chance to his detractors to point fingers at him, besides taking a toll on his credibility among the common Gujjars. The knives are already out with Atar Singh Bhadana, a Gujjar leader and a former MLA, dubbing the mahapanchyat as “politically motivated”. He also accused the BJP of pushing its political agenda through Bainsla, who, according to him, is “playing into the hands of the BJP”. Bainsla’s journey from former CM Vasundhara Raje’s worst nightmare to a BJP leader, has been marred by controversies. His popularity graph soared in the summers of 2007 when he led a strong protest in Dausa. The act was repeated in 2008 when the agitation took a violent turn and 71 Gujjars were killed in police firing. As Bainsla gained stature, he became an eyesore for other leaders of the community which then got divided into pro-Bainsla and anti-Bainsla camps. However, the rumours of a “secret pact” between Bainsla and Raje came back to haunt the former when the implementation of five per cent quota for the community got delayed even after being passed by the state Assembly in July last year, five months prior to the Assembly polls. Hyderabad is fast emerging as the focal point of the swine flu infection in the country with the city accounting for six out of the total eight confirmed cases of the H1N1 influenza. The latest was the case of human-to-human transmission of the deadly virus, affecting four persons in all. A 28-year-old software professional, who had travelled from Philadephia to the city by British Airways flight 277 on May 31, was tested positive for H1N1 influenza on June 4. He transmitted the infection to his younger brother, a 25-year-old engineering graduate from the city. A 31-year-old woman and her four-and-half-year old daughter, who travelled by the same flight, were also infected with the virus. The mother-daughter duo, who belong to Karimnagar district, were seated two rows behind the techie on the British Airways flight. Their swab samples tested positive for swine flu yesterday. Alarmed over the rapid spread of the infection, a central team of experts from National Institute of Communicable Diseases (NICD), flew down to the city today and discussed the situation with Medical and Health Minister Sudarshan Reddy and top officials. Meanwhile, the state government has initiated steps to trace all those who had travelled by the British Airways flight from Philadelphia to Hyderabad via London on May 31 and appealed to them to come forward and get themselves tested without further delay. Four more people who travelled in the same aircraft have been called to the hospital and are under observation. The total number of swine flu cases reported in the state now stands at six. Of them, one patient has already been discharged. The other five are being treated in isolation at the Government Chest Hospital in the city. The Electricity Board, which is on the defensive due to bitter criticism of its scheme subjecting “dishonest” areas to erratic, unscheduled and long-power cuts while maintaining round-the-clock supply in “honest areas”, says that of the 13 lakh premises having domestic connections inspected in the last fiscal year, as many as 2.80 lakh were found to be indulging in power theft. The board says it has put up around 25 thousand cases of power theft before courts and had collected fines from the rest of the pilferers. The board, under its new policy has divided the power feeders in the cities and towns into four categories, where the power theft is less than 25 per cent , where it is between 25-40 per cent, 40-60 per cent and more than 60 per cent. The areas falling under the first category get uninterrupted power supply. Those in the second category are disconnected from power supply for four hours every day, the third category feeders have to do without power for six hours while in the feeders where more than 60 per cent of the power supply is gratis, power supply is snapped for eight or more hours. “Less the supply, less the theft”, is the logic. The new policy has kicked up a big row. It is being criticised not only for penalising even the “honest” consumers living in “dishonest” areas but also for being “brazenly profit-oriented” with no commitment towards the “poor and the vulnerable” of the society. Most of the “dishonest feeders” cover slum settlements. Facing the flak, the board has released figures to prove that a sizeable section of the domestic power users were “dishonest”. the company has announced that it would try to separate the “dishonest” from the “honest” at a more micro level. Director General of Border Security Force ML Kumawat today said here unlike the previous governments, the present political regime in Dhaka appeared to be more receptive to New Delhi’s concerns. BSF chief was on a two-day visit to review the security scenario along the country’s frontiers in Assam, Meghalaya, as well as counter-insurgency operations by BSF personnel in Assam. Kumawat said the Bangladesh Rifles (BDR) chief, during his recent visit to New Delhi, had assured of action against Indian terror outfits taking shelter in his country. “There are indications of mounting pressures on the Indian militant groups in Bangladesh as the outlawed United Liberation Front of Asom (ULFA) and other terror groups are desperately trying to find safer haven elsewhere,” the BSF chief claimed. Kumawat is scheduled to visit Dhaka to pursue all pending issues with Bangladesh. He said the BSF had expedited efforts to complete construction of fencing along the frontier with Bangladesh by 2012-13. There is plan to reinforce its presence along the frontier with additional forces and force-multiplier technology. The government of India has decided to raise 29 additional battalions of the BSF and set up over 500 new Border Outposts (BoPs), most of which will be located in India’s porous and sensitive northeastern region, especially on the Indo-Bangladesh border. India and Bangladesh share a 4,096-km border in northeastern states and West Bengal. Currently, over 70 BSF battalions are deployed along the Indo-Bangladesh border as well as for counter-insurgency operations in the North East. In order to facilitate more effective vigil along the frontier with Bangladesh in the North East, distance between two BoPs will be reduced from the present 4.5 km to 2.8 km, considering the peculiar topography of the region. The ideal distance between two BoPs should be 3.5 km. For the purpose, 383 new BoPs will be set up along the Bangladesh frontier in the North East. The legs, arms and torso of a 42-year-old travel agent were recovered from different locations, while a search is on for his head. According to the police, a black polythene was picked up by a passerby in a busy street in north Chennai in the morning and it contained two chopped arms. Soon, the police received another call saying that two chopped off legs were spotted at another place. Tension gripped these localities as the news of chopped body parts retrieved from various places spread thick and fast. The identity of the man was established with the address. It was revealed that the dead man was G Suresh Kumar, who runs a travel agency and involved in jewel business also.